How Can Dental Bonding Help Your Smile? Are your teeth a little worse for wear but you don’t want complicated and expensive dental procedures? Cosmetic bonding may the simple solution you have been looking for. 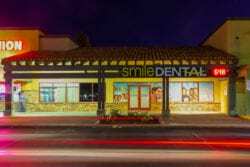 Smile Dental Group, your East Palmdale, CA dental office, explains how this relatively inexpensive and increasingly popular cosmetic dentistry treatment can help you have the smile you want. Cosmetic bonding is a procedure that repairs damage and defects in your teeth. Your Smile Dental Group dentist uses composite resin, a soft, plastic-based material, to fill in the damaged areas of your smile. Composite resin is similar to the spackle used in home repairs but for your teeth. It can be shaped to fill in any chip or indentation, making it ideal for treating an assortment of cosmetic dental issues. Once the resin hardens or bonds — hence the name of the procedure — it will not only be as strong as your natural tooth enamel but it will look just like it as well. Your Smile Dental Group dentist will choose a composite resin that is colored to match your tooth enamel so that the bonded area is never obvious. What are the signs dental bonding may be necessary? Chips in teeth, even small ones, can be noticeable. But bonding can be used to fill in these chips. It can also be used to protect roots of teeth that may be exposed due to receding gums. Due to heightened sensitivity to hot and cold foods and beverages that can occur without that protective layer of gum tissue, eating can become painful. Covering the roots with composite resin can decrease this sensitivity while protecting the roots. Maybe you have one tooth that doesn’t look like the others? Sometimes a tooth can be discolored, twisted, crooked, short or oddly shaped teeth but still in perfectly good shape otherwise. Bonding material can be used to change the appearance and color of the tooth, giving your smile a more uniform look.. Cosmetic bonding is also a good choice for filling in small gaps between your teeth. Gaps in your teeth can trap food and cause you to feel self-conscious about the way your smile looks. Bonding is a simple and relatively affordable way to close those spaces and make eating easier. While composite bonding doesn’t have the longevity of veneers, you should be able to wear them for up to 10 years if you care for them properly. This means avoiding hard candy, ice cubes and other hard or sticky food that can crack your composite material. Cosmetic dental bonding can give you the healthy smile you’ve always! 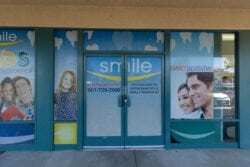 Call Smile Dental Group, your dental provider in East Palmdale, CA at 661.463.6530 or schedule online for your consultation.